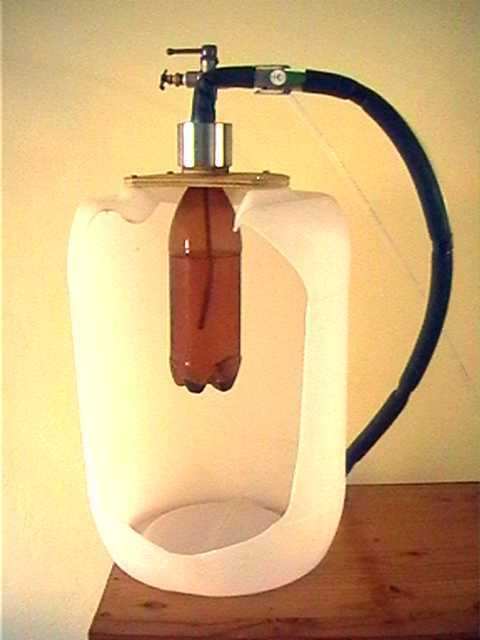 Usually counter-pressure bottle filling equipment is prohibitively expensive, but one of our club members, Roelf Loots, came up with a design that makes counterpressure filling easy and affordable. It is based on using PET bottles, that simply screw into the filling head, making sealing easy and practical. This head is patented, but consists of a stainless steel cylinder, with a socket (central axis, bottom) to screw in a PET bottle, a socket for the liquid line (central axis, top) and a socket for the gas line (off-center, top). By mounting this filling head, and attaching the necessary valves, keg and CO2 cylinder, you're ready to fill! The diagram below shows the valves and piping I used. The three-way valve makes operation easy and more fool-proof. The first picture shows how the filler was mounted on a plastic container. This contains spurts, splashes and foam, and makes everything easier to clean. The second picture shows some detail of the head. The black insulated pipe in the front is the beer line. The 3-way valve is the topmost valve with the grey handle. The gas purge valve is an inexpensive motor bleed valve.